To view 17 more pictures, interactive maps and the full, detailed description of the Coastal Villas by the Bay community, please Login. Coastal living just might be more affordable than you once thought. Coastal Villas by the Bay is a beach inspired new construction community of affordably priced condos. 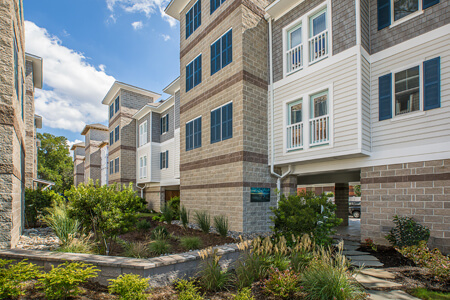 This community is a quick walk or bike ride to the beautiful Chesapeake Bay. The Villas boast amenities like a beautiful rooftop terrace for relaxing or entertaining. The ground level also has a lovely landscaped courtyard with grilling stations and inviting fire pits. The 2 bedroom, 2 bath condos are designed inside and out for the beach lover. A warm beach pallet coordinates the finishes all the way down to an optional sea glass back-splash in the kitchen. Granite countertops and nine foot ceilings compliment the driftwood finished hardwood floors. Luxurious master bedrooms come with Juliet balconies for picturesque views. Each unit has two reserved parking spaces along with a private storage unit. Shopping, dining, and anything else you need is all within easy access. This community is a quick 10 min walk to Joint Expeditionary Base Little Creek-Fort Story, less than 20 min drive to Norfolk Naval Station and about a 20 min commute to the Norfolk Naval Shipyard. If you thought coastal living was out of reach, give us a call and let us help you check out the possibilities. You could be watching the golden sun setting from this rooftop terrace before you know it! Send me more information about the Coastal Villas by the Bay new home community. Our agents gladly offer FREE property tours of Coastal Villas by the Bay, Norfolk and homebuyer consultations to all serious buyers.